Max Ghenis has a nice text analysis of Martin Luther King Jr.’s famous “I Have a Dream” speech. You can read about his methodology here: Statistics meets rhetoric: A text analysis of “I Have a Dream” in R.
This got me wondering about the President Obama’s 2014 State of the Union speech. Using his template, you can see below that the speech is slightly positive in the main, with a bit more positivity for the last 10%. Without hearing the words, the data reveal a generally optimistic, yet restrained message (most data points are within 0.2 units). Readability was also fairly steady on the average, but there is quite a bit of variability on the higher end. This reflects a speech that was written intentionally at a generally high school reading level, yet occasionally included some “big words.” It seems that these words were not clustered together, so perhaps one goal was to avoid stretches of time with less familiar words. 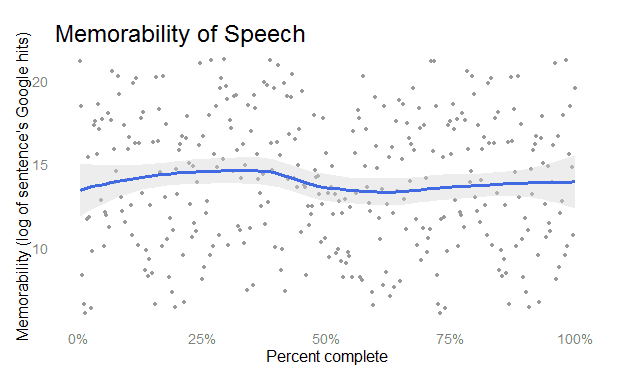 Now, sentiment and readability can be thought of as inputs to a speech–ingredients in a soup. One output of a speech is memorability. I use Max’s general idea of using Google search hit counts as a proxy for memorability. What’s the verdict? Fairly bland results. Well it has a couple of inflections, starting out rising, then a dip at about the 40% mark and then a slight rise to the end. 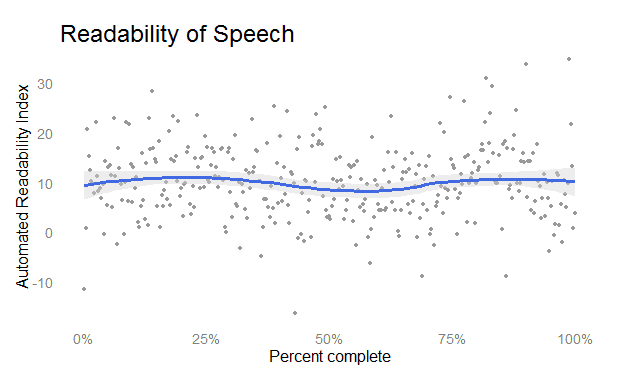 Some quick analysis shows that readability is more important than sentiment when it comes to predicting the memorability of the speech’s sentences. 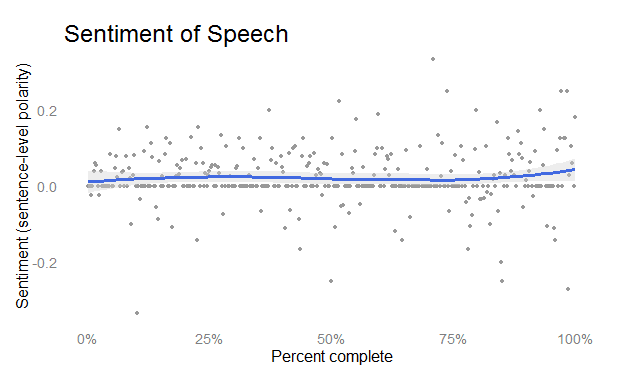 However, neither attribute was very predictive for this particular speech. What were the most memorable sentences? And when our children’s children look us in the eye and ask if we did all we could to leave them a safer, more stable world, with new sources of energy, I want us to be able to say yes, we did. When we rescued our automakers, for example, we worked with them to set higher fuel efficiency standards for our cars. Our freedom, our democracy, has never been easy. “We are the face of the unemployment crisis,” she wrote. Kids, call your mom and walk her through the application. Two appeals to grand ideals (1 & 3). Two references to considering red tape a benefit. (2 & 5). One quotation reminding us of real human suffering (4). I think people from all parties might consider that a representative mix of Barack Obama.